oh! oh! 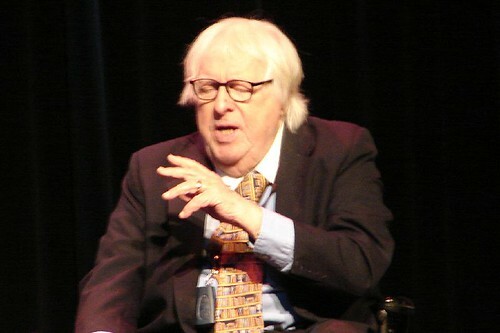 i suggest that people read poetry and they ignore me but RAY BRADBURY does and it's all...oooh, we should read poetry! FINE! he's a very cool dude. and he looks a lot like my grandfather, so i always liked him. but i am still disturbed about that one story about the baby that's born in another dimension so it only appears here as a pink triangle or something. it's just WRONG! Hey, I'm just saying what he said. I didn't read a poem that night or last night, so there! Tee hee! I was trying to think if I have a favorite poem, but I'm just not that intellectual I'm afraid. There is one in French I really like and I know I have it somewhere, but I can't find it. Darn! heh heh heh. and no one should be afraid of poetry. it's like...anything. you like what you like and no one else is (or should be) allowed to criticise you for it. hey, one of my favorite poems is about a guy trying to get a chick into bed. that's hardly intellectual!
. I have to either force myself to read them very slowly, or I have to read them aloud (or subvocalize). The same thing works for plays, I have to read them aloud or have seen them performed before I read the text. It was an incredible event!! !